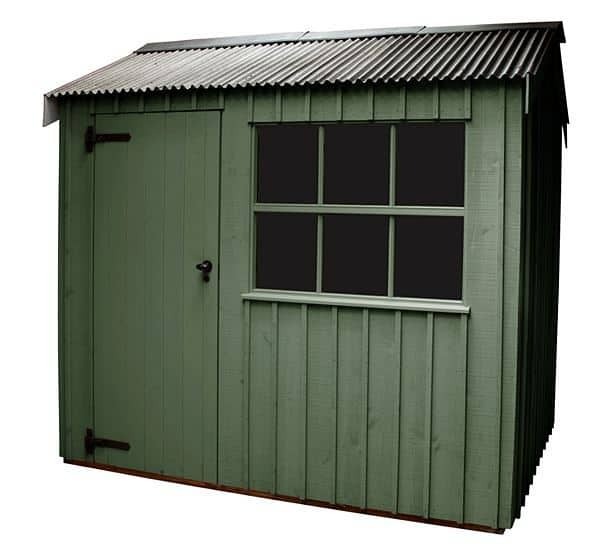 The Felbrigg Shed from Crane is another fantastic addition to their National Trust line of sheds and this one right here is continuing their trend of taking inspiration from classic, old English style sheds. This is clear the moment that you see the glorious…… and of course, very English corrugated roof that this shed has. 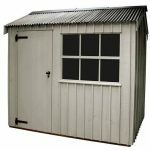 Another feature that has become standard in these types of shed and something that really stands out is the Georgian style window. While this may not seem the most “exciting” shed the first time you see it when you take a moment to realise that old, East Anglian style sheds were the design inspiration here then the charm of the shed becomes apparent. 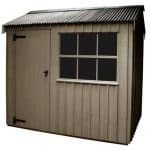 In all this just ticks the boxes of everything that you would want from a classic English style shed. But as well as looking nice, you have on your hands here a shed that is made from the finest and strongest Scandinavian Redwood and will be something that will last for very long time and most importantly keep your gardening items, tools, millions of pounds or whatever it is safe and dry. To make sure you know if this is the shed that is perfect for your garden. 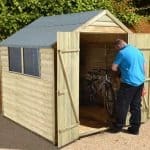 We have taken much closer look at this shed and will tell you all you need to know so you can decide if this is the right shed for you. 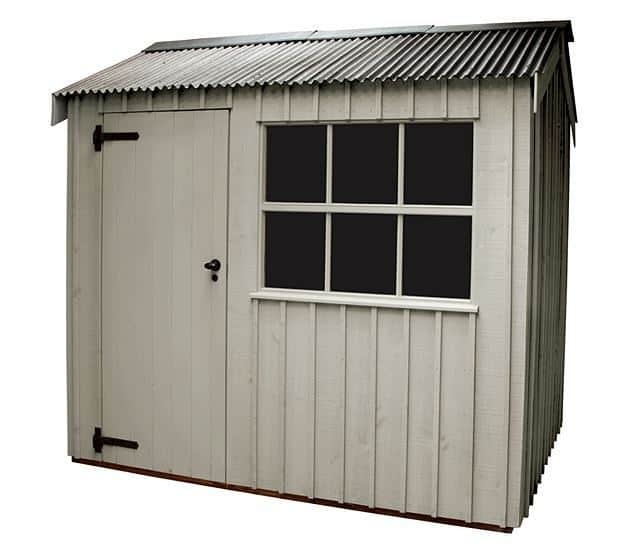 This is a good sized shed that offers you plenty of storage space. The height of the shed is quite nice and at the eave you have just over 6 feet of height which is quite high so unless you are Andre The Giant, you will not have to be hunched over the whole time you are in here. You have a good floor space of 7 feet 8 inches by 9 feet 5 inches. So as you can see you have a great amount of space to store things on the floor, but if you add in a few shelves to the wall, you have just a lot of space to play with here. 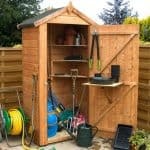 This is the kind of shed where you can easily keep your lawn mower, tools and a whole load of other items as well. We really do love the storage space that this shed offers and actually see it as the strongest point of the shed. One of the standout features of this line of Crane sheds is the corrugated roof. If there is one thing that makes a shed seem “British” then it is corrugated roof sheeting which is what Crane are using here. Now this does of course add to the price of the shed and you do have to decide if this makes the shed worth the extra money over say a shed that uses roofing felt, but make no mistake about it this is a strong roof and one that looks bloody gorgeous. Underneath that corrugated roof we have some 19 x 125 mm tongue and groove boarding which is what we would expect from a Crane shed and it is strong and along with the corrugated roof, form a tag team that fights off any kind of nasty weather we may have. Now we will admit that when we first started looking at this line of Crane sheds and realised that they used, vertical sawn board cladding that we got a little bit snobby and turned our noses up a little bit….. more fool us as not only does this type of cladding give the shed a very nice and in today’s flood of shiplap and overlap cladding sheds, a somewhat unique to this line look. But as good as it looks, Scandinavian Redwood is what this cladding is made from and wow is this wood nice and strong! At 14 x 30 mm thick this is more than strong enough to take whatever the weather and your kids or grandkids can throw at it. It does not matter what your cladding is made from if the framing of your shed is as flimsy as a kids playhouse! Well Crane like they do for the other sheds in this line are using their tried and tested, 38 x 50 mm planed framing. This is more than up to the task of offering years and years of stability and keeping your shed strong as an ox for a very long time. Weak framing is a big pet peeve of ours so we get a real kick out of what has been used here. Flooring is one place where we have seen more than a few sheds over the years “cheap out” a bouncy week floor that you are scared to put any weight on is enough to make any shed a waste of money! Well here we have that same, 19 x 125 mm tongue and groove boarding which was used on the roof and it is made from strong wood, but along with the floor joists which are 38 x 50 mm will make sure that your floor will be more than able to handle all the things you plan on hoarding in your shed. 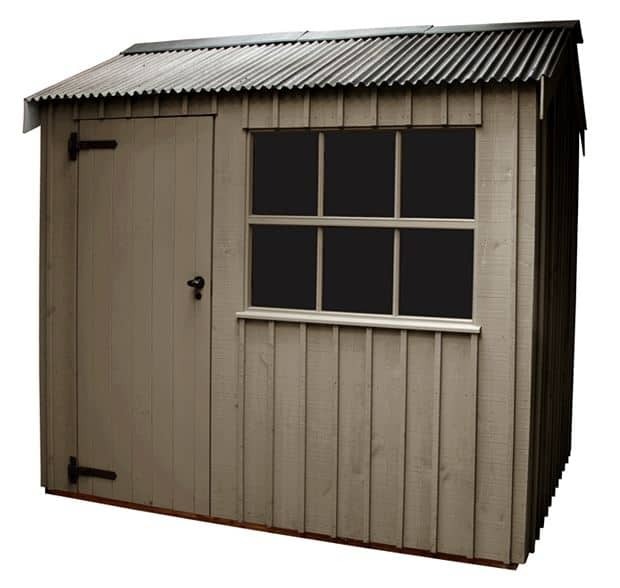 Crane offer a very nice two year warranty with all sheds and their Felbrigg Shed is no different. Now this is a great warranty which will see them replace or repair any damages that are caused by natural wear and tear…… so in other words no abuse or “accidental damage” is covered. So if you slam the mower into it and put a hole in the shed…….. then you are not covered. To be honest we think this kind of warranty is more than fair and when you are spending this kind of money of a shed, you should be taking very good care of it anyway. As far as the door goes, you have a single door that is 710 x 1800 mm in size…. We know first-hand how annoying and frustrating it is trying to get a mower into a small shed door. Here you have more than enough room to get pretty much anything in and out of the shed without having to wrestle with it. The door has two very nice hinges that are jet black and as well as making sure your door stays in place, look very nice also. To go along with the hinges Crane use the same black on the door knob which again adds to the overall nice presentation of the shed. Crane really do not cut corners when it comes to the windows by offering plastic or some other kind of weak style of windows. Here you have a Georgian style window that is made from 4 mm thick, toughened glass. This means the window is not only a very striking feature of the shed, but it is also very tough as well. The Crane National Trust Felbrigg Shed is one tough beast of a shed. 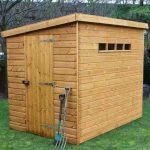 That Scandinavian Redwood is as tough as a grizzly bear and along with the strong door, mortice lock and extra tough glass window makes for a shed that will be sure to keep your belongings safe…… and also do it in style. Now as far as privacy goes, we think that this is a “personal” type of thing where you are either fine with the window being open to all eyes or you may want to put some kind of curtain in there to keep peeping peepers from seeing what you have. 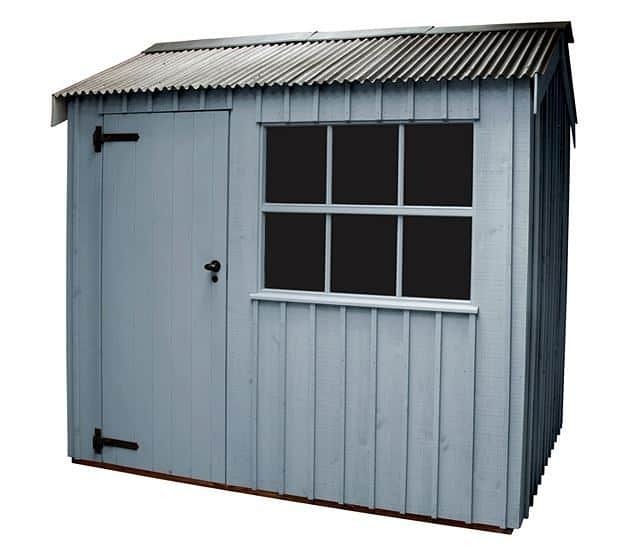 Offering six different colours of paint for the shed ranging from Wades Lantern which is a more traditional wood type of colour to Painters Grey which has a nice, blue type of effect to it. Crane do have a colour that will be perfect for your garden no matter what your style is. Strong as an ox and pretty as a peacock. This is a shed that offers a good balance of being strong enough to take on our “amazing” British weather and also being very easy on the eyes. With the Scandinavian Redwood cladding, good floor joists, corrugated roof and just the overall way Crane build the shed, you have a shed that is going to last you for many years and look great in the process. This is a high price and end shed, but this is because they use such great materials. 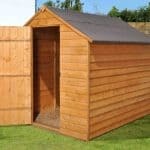 An 8 x 10 shed is a great size and ideal for most gardens. You have enough storage size, but it means the shed does not take over the whole garden. With the strong cladding that is used, you can put up a few shelves to really maximize the size of your shed. 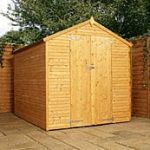 While it can take up to 12 weeks for them to make, deliver and then install your shed… the key word here is they! They do everything, you do not have to get your hands dirty or worry about not building it right as they do it all……. And they do it right. Ok so 6/10 may seem not very high, but we feel that this while strong and offering a good storage space is very pricy for the style of shed. 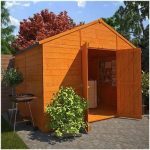 It is not as “adventurous” in its design as some of the other Crane sheds are and the basic “look” of the shed may make you question the price of this shed. Final Thoughts: This is a shed that does offer the best of what Crane offer. We are talking that strong, Scandinavian Redwood which is used throughout the shed, a bullet proof window (not actually bullet proof please do not shoot it!) great storage space, corrugated roof and much more. And yes we do really like this shed, but it is on the pricy side we must say that. 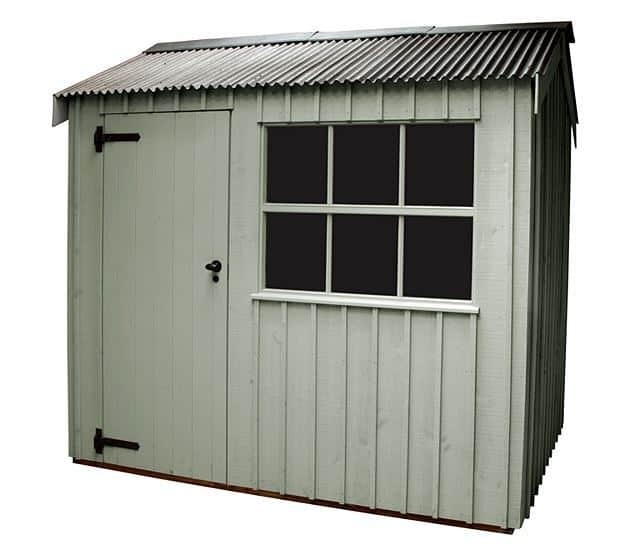 Still if you have a proper English style of garden and are looking for a nice, strong and spacious shed to compliment that then this is a shed that will be more than up to that task.